Clear wood toned fire protection. 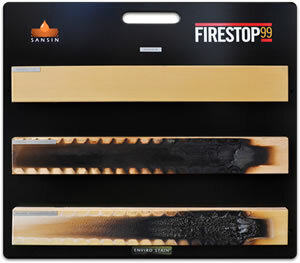 FireStop99 delivers the ultimate flame spread protection in an attractive interior wood finish. In the presence of heat or flame, Firestop99 will intumesce (expand its film thickness) creating a thick charred heat-insulating foam layer. This action prevents oxygen from reaching the combustible coated materials (the “fuel”) and diluting combustible gases if released by the fuel. FireStop99 provides “Class A” flame spread protection that conforms to ASTM E84 and Canadian Standard CAN/ULC S-102-10. 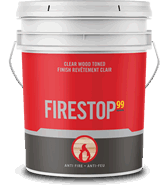 FireStop99 has excellent adhesion and is low-VOC, with two-coat application and simple soap and water clean-up. Available in clear or custom tinted tones.